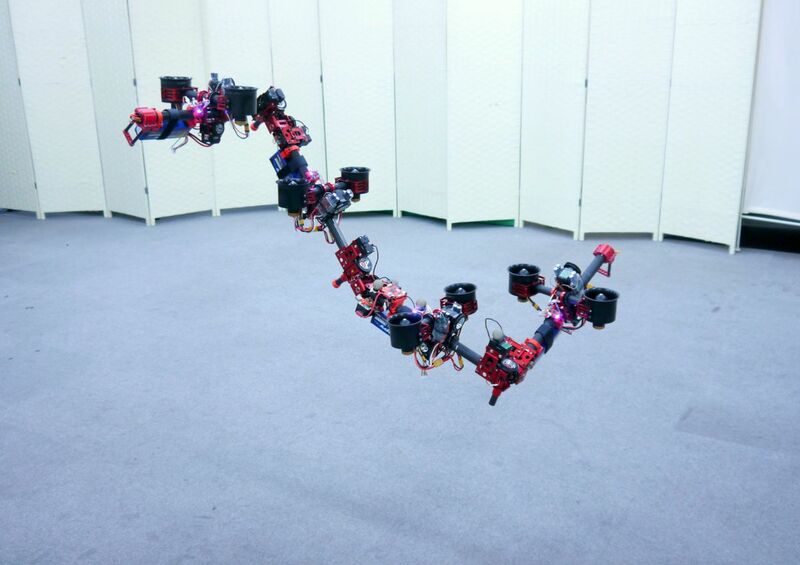 Researchers at the University of Tokyo’s JSK Lab have developed a “dragon drone,” made up of several small drones and capable of transforming on the fly, as reported by IEEE. Not only can the drone change into different shapes, like a square or curved line, it can also autonomously decide what shape it needs to change into depending on the space it requires to navigate. The name of the drone is actually an acronym, standing for “Dual-rotor embedded multilink Robot with the Ability of multi-deGree-of-freedom aerial transformatiON,” or DRAGON for short. Its design was modeled off of traditional dragon kites, where the tail is made up of a series of smaller, interlinked kites. The small drones are each powered by a pair of ducted fans that can be adjusted to vector thrust in almost any direction. The whole thing is powered by an Intel Euclid dev kit and has a battery pack along the spine that provides up to three minutes of flight time. This particular version of the DRAGON drone in the video has four modules and is shown rearranging itself into a square, as well as unraveling to move upward through a small opening. Although the obvious application for this type of drone is to navigate small spaces, the team behind it sees a much bigger application. Eventually, the DRAGON drone could have up to 12 modules and JSK says they see it operating like a flying arm — interacting, moving, and manipulating objects, or even picking up things by using the two end drones like a pincer. As it stands, the actual use cases for this type of drone are vague, but the tech is certainly exciting. It could find a place in industrial use (navigating ducts, for example), or perhaps within search and rescue scenarios.